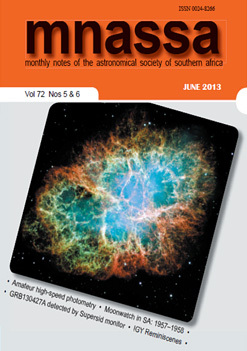 The Monthly Notes of the Astronomical Society of Southern Africa (mnassa) is the official journal of the Astronomical Society of Southern Africa (ASSA) and publishes material of interest to professional and amateur astronomers. Research papers are subjected to peer review before publication. mnassa is indexed in A&A Abstracts and therefore the articles at any level should be of a high standard. 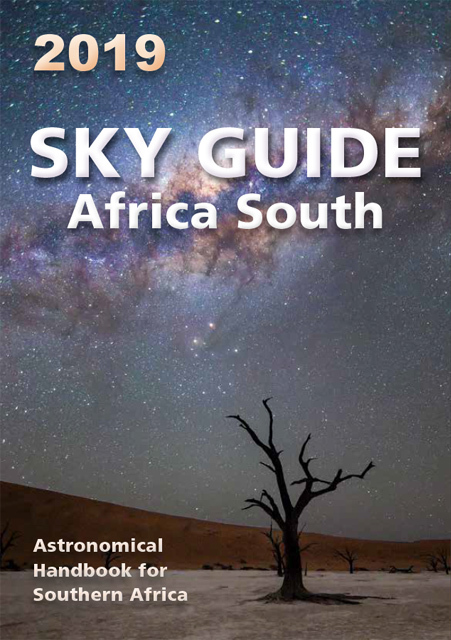 The latest edition, and archival copies, can be found on the mnassa website. the observer’s page (accounts of the activities of the various observing sections within the Society). There are no page charges, but it is important for papers to be concise. A Style guide and instructions to authors and a Word template are available to orient authors. 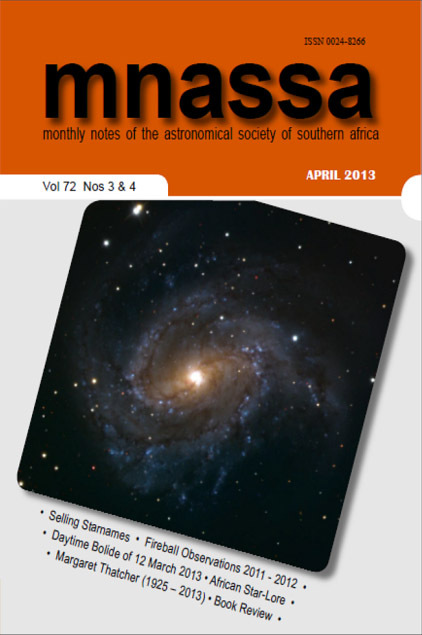 Contributions may be submitted by normal mail, but submission via e-mail to [mnassa saao.ac.za] is preferred. Please include the word “MNASSA” in the subject line of your e-mail. Enquiries and copy should be sent to the editorial address. Volumes 1–15 (Condensed) of mnassa, volumes 16–62 of mnassa, all volumes of JASSA, and the Proceedings of the 2nd ASSA Symposium were indexed and compiled as a chronological table of contents (1923-2001).